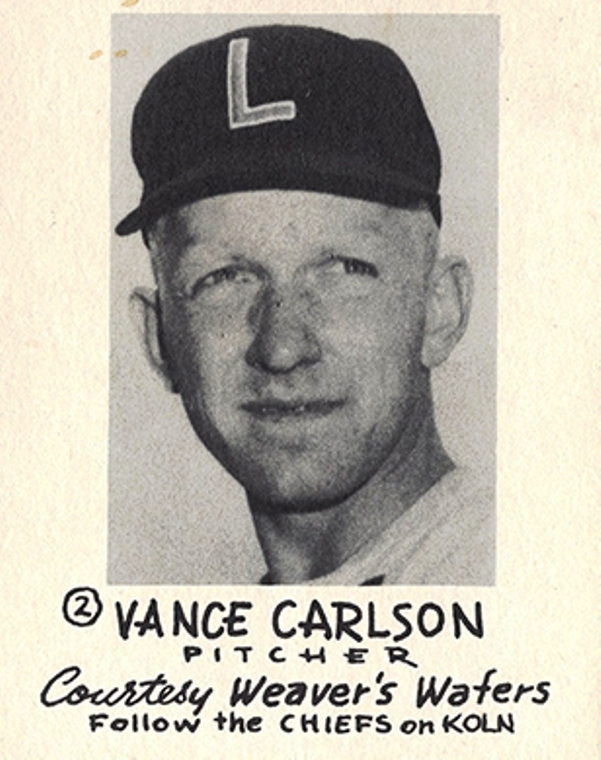 Vance Carlson came up with the same aspirations of making the major leagues and achieving Hall of Fame stardom that fuels every minor leaguer. He realized one of those dreams; however, it was not for his pitching prowess on the diamond, rather it was for his officiating skills on the football field. The 2003 Kansas Sports Hall of Fame inductee, who was one of the top football officials in Big Eight Conference history, died September 17, 2018 at the age of 92 in Ellis, Kansas. Vance Carlson 1954 Lincoln Chiefs / Mile High Card Co.
Born November 14, 1925 in McPherson, Kansas, Carlson built his legend locally as a multi-sport star at McPherson High School. He had his first opportunity to sign professionally after high school with the St. Louis Cardinals, but his father held out for pinstriped pastures. Carlson had little time to savor his contract, as he entered the Air Force in 1944 during World War II. As a newbie in baseball, Carlson could not earn placement on one of the prominent bases to keep his skills sharp. He returned from his military service to the Yankees organization in 1946. While his World War II duties kept him from staying in baseball shape, his ledger said otherwise. He posted a 17-8 record with a 2.93 ERA for their Class C team at Twin Falls in the Pioneer League. It was the start of a nine-year journey through the minor leagues. Carlson crossed paths with future Yankees stars Billy Martin, Tom Sturdivant, and Whitey Ford while in their system, but ultimately he could not follow them on their major league path. He reached as high as the Pacific Coast League, which at the time had an Open classification, but that was as close as he got to the majors. Beating the bushes for almost a decade, Carlson had his share of his minor league woes. He shared his favorite tale, which occurred in 1952 while playing in AAA for Toledo. Just as he arrived to the club, he found himself trying to protect his valuables, not from teammates or thieves, but from creditors. Not all was lost that year with Charleston, as he made good with another ballplayer that later followed Carlson’s path to a Hall of Fame in another sport. This time he bonded with a a future basketball Hall of Famer. Looking back at his time in between the lines, Carlson thought that he dragged out his career with the hopes of getting to the major leagues. He felt that he was often on his own due to the lack of available coaching down on the farm. Carlson spent 27 years as an NCAA football official, which included being at the helm of four national championships. He shared his perspective about the multitude of changes he observed in athletics since he started in professional baseball in the 1940s. “I'm disappointed about all kinds of sports, it's all about money,” he said. “That's what got these colleges in trouble; it's you either win or else. The coach has to win or else he is gone. That is the influence of professional football.